The holiday season is upon us in full force now. We just had Halloween and I am sure that your pantries are loaded with sweet treats from your kid’s baskets. Now as we start thinking about Thanksgiving, we wanted to share another fun sweet treat that your kids can help you make. 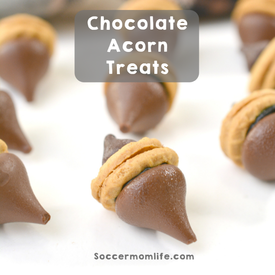 These Simple Chocolate Acorn Treats from Soccer Mom Life are made with just a few ingredients that are perfect for those little hands to put together.